This herb and fruit tea has a predominant orange character with the sweetness of pineapple. 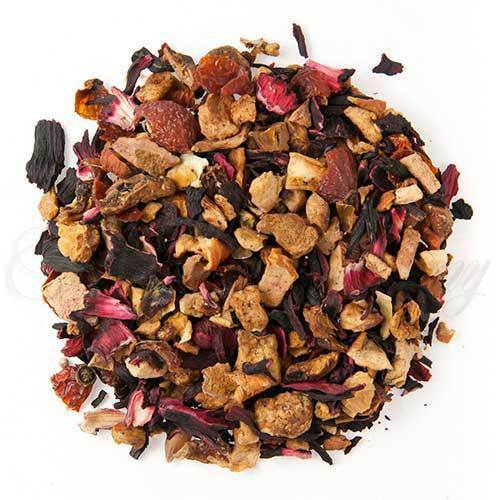 Combines apple, rosehip, orange, and hibiscus for a unique caffeine-free infusion. Herb and fruit tea in some circles is considered a new type of tea. We formulated this blend to accommodate tastes of people who wanted to experience a refreshing healthy new style drink without caffeine. What we got was a terrific ‘tea’ that is unbelievably delicious and enjoyed Hot or Cold! This tea has a very exotic flavor profile. The delicious blend of orange and pineapple flavors combined with the natural flavors and tartness of the various dried fruits create a summertime cooler or a wintertime summer reminder. On the west coast of Canada in the province of British Columbia, there is a small Haida village at the end of a long fiord called Bella Coola. The water is crystal clear, the mountains rise to the sky from the water’s edge, fishing boats head west towards the Pacific Ocean and bald eagles soar overhead screaming at those that dare to disrupt the tranquility. One bright cloudless day sitting at the town wharf contemplating life looking at the beauty and eating an orange Popsicle I realized that this was probably the tastiest Popsicle I had ever had in my life. The taste of Bella Coola is exactly like that Popsicle – the best herbal tea you will ever taste! For a summer time drink Bella Coola iced is hard to beat. It is refreshing and thirst quenching and not overly sweet. For formal times garnish the glass with a strawberry and a sprig of mint – for non-formal times pour it into your glass and enjoy it gulp after gulp! If you have small children use the Bella Coola tea to make popsicles – they taste great and contain very little sugar. By virtue of the fact that these blends do not contain any tea and are a special blend of fruits and herbs – they are caffeine free! An additional benefit is that these ‘teas’ contain Vitamin C. What could be better – a healthy drink that tastes GREAT!